When Swathi of "Zesty South Indian Kitchen " gave mango cheese cake recipe, I was in cloud nine.Because this is yet another bookmarked recipe,which I was longing to do.I bookmarked this cheese cake,when Sharmi's Passion , posted last year . 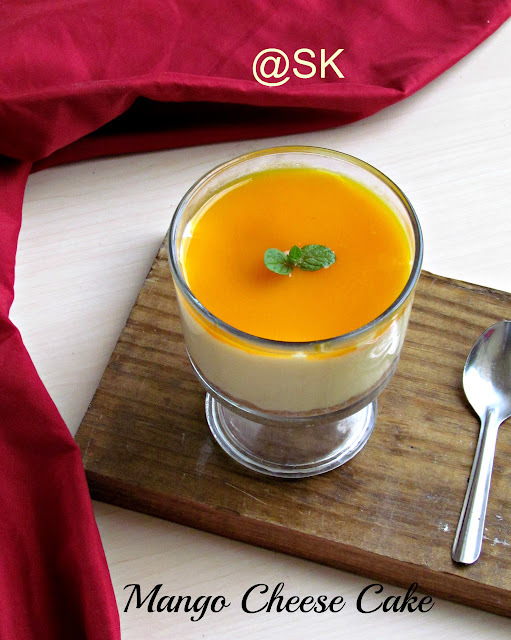 But it took 1 full year for me to try it.But I am so glad that it was my best choice for dessert.No bake mango cheese cake is nothing but,a 3 layered cake,where cheese and mangoes are used as main ingredients.The first layer is made using biscuits,second layer using the cream cheese and mango.The third layer is just the mago glaze to give a finishing touch to the cheese cake.Care should be made,when we set the cheese cake,if it did not set properly,then we will end up in a mango cheese pudding :) .We can use agar agar or china grass or gelatin to set the cake.I prefer to use agar agar instead of gelatin,as it has that strong flavour of meat.Agar agar can be bought in any Indian Grocery.My guests were enlightened by its taste. * Take digestive biscuits in a food processor and make it into crumbs.We can also use graham crackers for the base.I didn't use food processor.Just took the biscuits in a ziploc bag and crushed it using a rolling pin as shown in the picture.Take the biscuit crumbs in a mixing bowl.Now add melted butter into the biscuit.With our fingures,mix it with the biscuit crumbs.We can also add butter to the food processor with the biscuit and give it a mix. 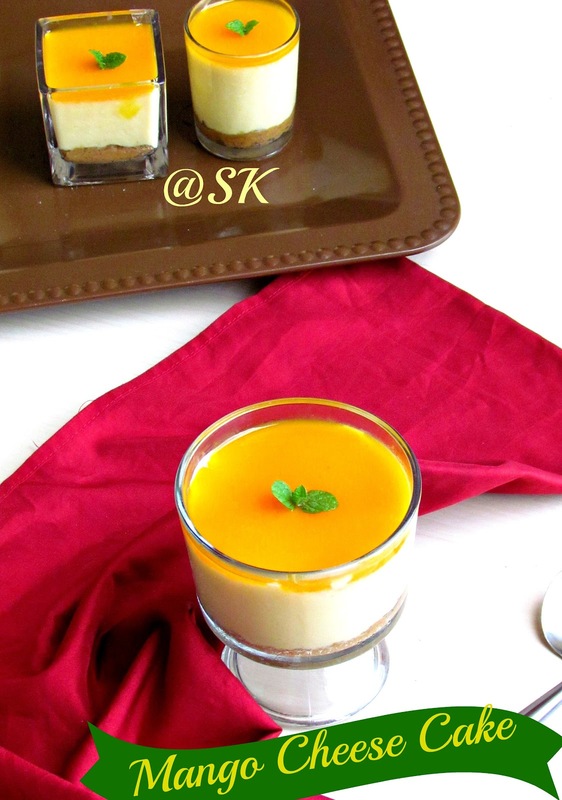 * Now take a 8 inch pan or 4 single serving cups and press the biscuit ,butter mixture firmly to form a base.I took 4 short glasses and used.Now place the glasses inside the refrigerator and let it set for atleast 20 minutes.Meanwhile we,can prepare the other layers.Take mango pieces in a blender and make it a puree.Measure it and pour it into a mixing bowl .Since I used canned mango puree,I skipped this step. Now take a pan,add water and bring it to boil.I used 4 tbsp of water here.You can use water from 2 tbsp to 4 tbsp.Add the broken agar agar pieces into the water and let it get dissolved .After a minute or so,water would have thickened . Turn it off. * Heat the mago puree for a minute in microwave.Because ,when we add hot agar agar water to the mango puree,the mango puree should also be hot.This enables the agar agar to set properly.Now add the agar agar directly to the mango puree and mix it.We can also use gelatin instead of agar agar. The amount is same (1 tbsp).In another mixing bowl,whisk cream ,sugar with cream cheese .Take half of the mago puree and agar agar mixture and mix it with the cream cheese mixture.Mix it well,so that it combines . If it is so thick,just pop it in the microwave and heat it for a minute,so that it will be in pouring consistancy.Now spoon the mango puree in all the glasses to give a beautiful glaze to the cheese cake.The layer can be very thin.as we are going to give a glaze alone.Wrap it with clear wrap .Keep it in the refrigerator again for overnight .Serve it with some mint leaves on top. 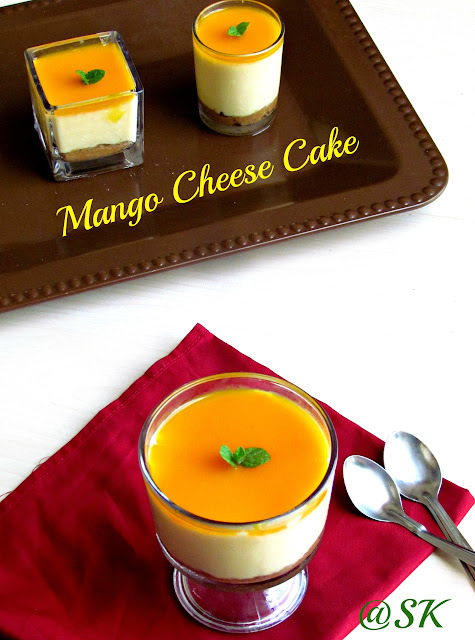 * While adding agar agar to the mango puree,make sure that both should be hot,if not the cheese cake will not set properly.Make sure it is set before the mango glaze is given.If not mango will mix with the cream cheese mixture. * We can also use gelatin instead of agar agar.But add boiling water to the gelatin to make it set.For gelatin,the mango puree need not to be hot . * Instead of cream and cream cheese,we can also substitue with paneer and hung curd.Paneer and curd should be dry and moisture free for the cheese cake to set properly. * We can also go wild and substitue mango with strawberry,blue berry or anyother fruits of your choice.Just adjust the sugar level according to the sweetness of the fruits. Beautiful clicks and such an irresistible cake. Wow, so delicious and lovely. Wish I had a bowl right away. So beautifully done and wonderful clicks. I am new to you place, but came through face book. You have lovely collection of recipes. I am happily following you. Will be happy if drop in my place as well. wow... luvely cup-cheesecakes!! and nice tips too! Your pics are tempting me a lot,got to try this..thanks for the step by step pics. Individual serving of these yummy cheesecake is a great idea...Loved it.. Delicious cheese cake, looks tempting! OMG ! I have no word to express... Looks super dooper.... Loved ur clicks and the glassware ! They were damn cute and seriously very catchy,love this beautiful no bake cheesecake. delicious n tempting n grt clicks. wow it looks stunning savitha. I had also planned to do it the same way. I love that center shape glass its beautiful. 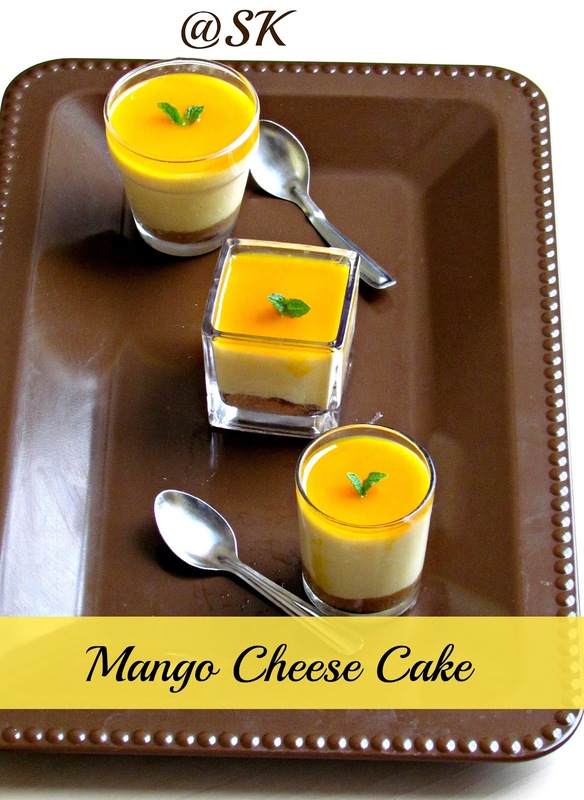 Mango cheesecake, individual version looks delicious, can you link this recipe to my page, so that I can pin it in our group board in pininerest. We showcase Mouthwatering Collection of World's Best Recipes to our readers daily. We would like to invite you to join our food community and want to feature some of your best recipes on our website. http://www.worldsrecipeshub.com/2013/03/shamrock-shakes.html where we link the full recipe back to your site.